I will be the first to admit I am not completely up to date with what has been happening in the Marvel Universe. I have been in and out of comic collecting someone would say most of my life. Mainly do to budget constraints and or availability is the reason I would even stop. The last time I even remotely felt like I was in the know was probably in the 90's. When they still had spinner racks. I would spend as much time there, reading everything I couldn't buy, while my mother shopped. I am older now. I am still in love with the medium and I can now afford the habit. Oh, Civil War II? Yeah, I'm not reading that... But this Avengers #7 looks interesting. There is a disturbance outside of Avengers HQ, which is Parker Industries, which is housed in the Baxter Building. Because apparently skyscrapers are limited in New York City. Those damn liberals and their constant recycling. This disturbance is a multi mouthed multi tentacled pink monster. No not that one sicko. This one is magic based, wait that doesn't help either. 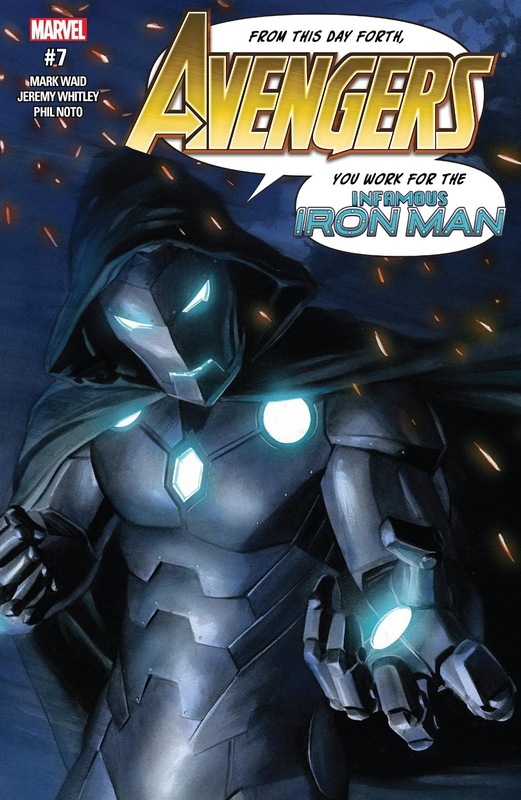 It doesn't matter it's basically just a plot device to get Infamous Iron Man in this comic which works for me. Doom swoops in and magically destroys the monster. Then demands the Avengers to work for him. Just when the Avengers are about to attack Nadia Pym/Wasp fan girls out and asks Victor back to the Avengers HQ for some tea. Here we get some exposition on what made Doom turn good and pick up the mantel of Iron Man. Basically Victor was sick and got better turned over a new leaf and since he respected Tony Stark the most and Tony is out of action. Victor is now Iron Man...go with it I guess. Doom has been tracking the source of the magic tentacled monster and has found its location but he needs Nadia to go incognito to prevent casualties . The magic is coming from the Susan Storm Camp for Girls' Leadership. The story makes a jump to a Nadia Pym character driven story as she searches for the magic source. Which turns out to be 5 girls who want to be rich and powerful some day and they sold their...No wait...they didn't have to give up anything. They were just waiting for someone to stumble upon them so they could trick that person into saying 'whatever you need help with I'm your girl'. Great you are now our sacrifice because we planed this ritual poorly and didn't bring a sacrifice. Good thing Nadia Pym was just strolling by and we made this magic circle that prevents her from using her powers. Cause Magic. That's okay for Nadia though cause you know...Avengers Assemble. We then get a little bit of a fight scene between some demon power suit girls. Until Doom and Wasp can team up to out magic the magic. They then save the girls from themselves and then at the end we get some more seeding for the the continuation of the Avenger X story line. I don't know if my disappointment was coming across in my review. I wanted a Doctor Doom as Iron Man story. 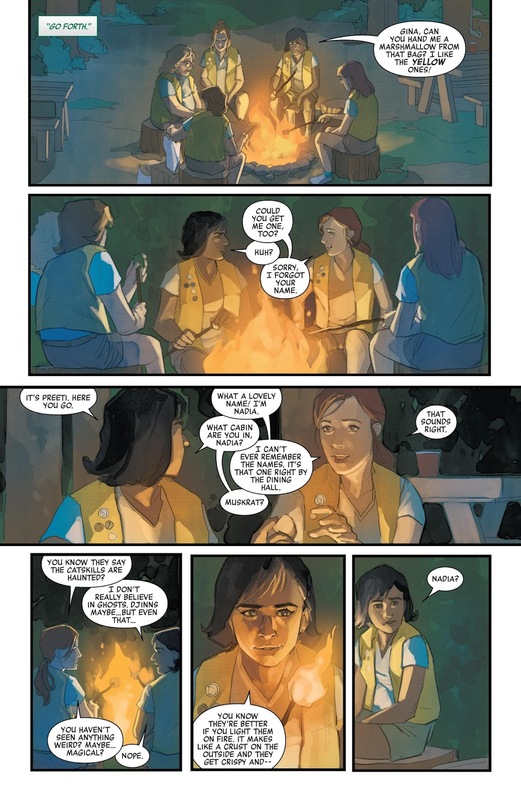 Instead I got a Nadia Pym at band camp story with a little weak magic. Having said that, every characters' dialogue is strong, spot on, and individual. 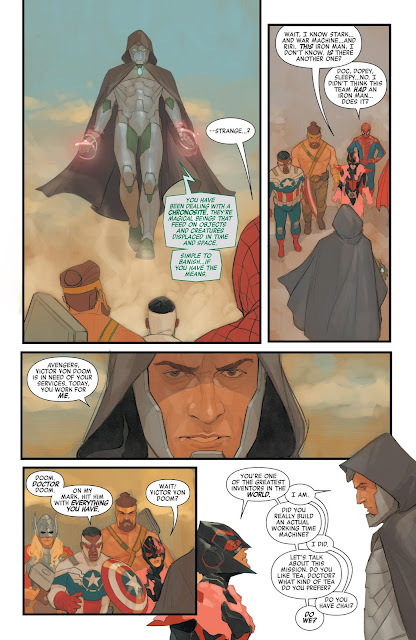 The art is good enough, I think Noto paints better people then costumed heroes. 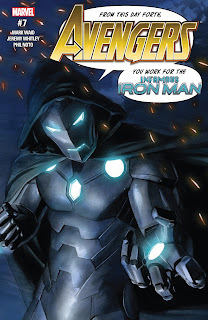 I feel this story was only written to promote the Infamous Iron Man and Unstoppable Wasp titles. It had some good character moments. Waid can write the hell out of any character. I also like the voice Whitley gives to the Wasp. It was a little bit of a bait and switch if you ask me, but I had fun.